Why would someone impersonate a Freemason? And why would someone publish a book showing some of the supposedly more nefarious characters who have impersonated Masons? Pictured here is a page from a book called Album of Masonic Impostors [Call no. : 19.78 .A345 1903], which was published by The Masonic Relief Association of the United States and Canada, an organization which was a sort of clearing house for improving the methods for providing relief by various Masonic organizations, as well as a central organization for disseminating informaton throughout North America about men known to have tried (or, in many cases, succeeded) in defrauding various Masonic relief agencies by claiming membership in various Masonic bodies. Because there was money to be had by members of a fraternity who were genuinely in need, a brisk business grew of con-men who traveled around posing as Masons and trying to get relief (in the form of money) provided by various Masonic organizations in the different towns and cities they visited. The Masonic Relief Association published an "Official Warning Circular" on a regular basis (a number of which we also have in our collection), that warned various Masonic relief organizations about some of the con men that might come their way. The Album of Masonic Impostors is a bit of a rogues' gallery of some of these men. Call me soft-hearted, but when I see these photos, like the one of C.S. 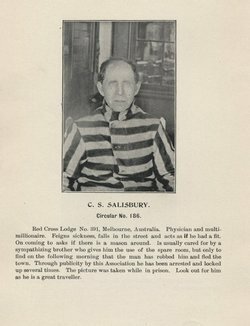 Salisbury above, I wonder what desperate circumstances drove men like him to resort to becoming "Masonic Impostors." Beito, David T. From Mutual Aid to the Welfare State: Fraternal Societies and Social Services, 1890-1967. Chapel Hill, N.C. : University of North Carolina Press, 2000.